Comments: Created by Steve Gerber and Jack Kirby. Both Steve Gerber and Jack Kirby had issues with Marvel Comics over copyrights and royalties relating to characters they had created while working for that company, and when Gerber entered into a legal dispute Marvel over who owned Howard the Duck, Gerber soon found financing his fight against a corporation difficult. In order to help him out, a number of fellow comic book professionals banded together to produce a benefits comic to raise money for his case. 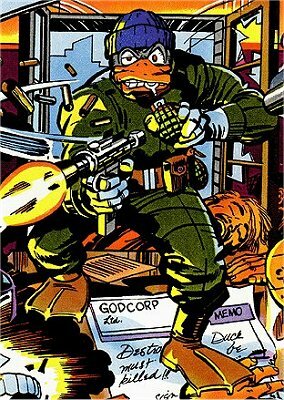 Destroyer Duck's fight against Godcorp was intended as a satire of how Gerber felt he (and Howard) had been exploited by Marvel. The story would carry on for many years (and printed by many companies), until Destroyer freed his friend in an Image comic. Thanks to Josh Geren for providing much of the above information.